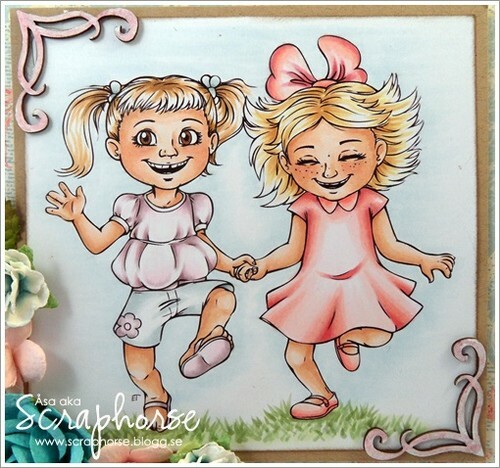 Today Im bloggin over at Make it Crafty, and for this week the theme is Girlfriends. Zoe also gave us a clever little color challenge; only color with really light colors! I tend to use dark colors when Im shading my images. And I can tell you, I was REALLY close failing. He, he. I almost grabbed the dark one on habbit. I’ve used the wonderful image Girls Skipping Merrily. I also used some of the wonderful Corner Chippies! Kul utmaning och snyggt färglagt!! Superfint kort och stämpeln är ju så härlig!! Men jisses, vilken kanon fin färgläggning igen. Vet faktiskt inte vad jag skal säga,men har stirrat på detta i snart 3 min. Otroligt!! !